LED dioderne i denne lampe sidder sammen 3 og 3 i RGB. Det vil sige at de 3 forskellige farver kommer samme sted fra, hvilket giver et mere "roligt" lys uden farveskygger. The Spectral M400 is the latest addition in the popular Spectral range. 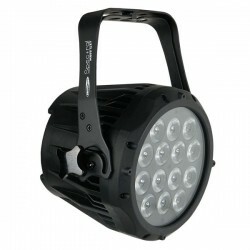 It is a smaller version of the Spectral M800 and is equipped with 7 pieces Tri colour LED's with a superb colour mixing and an excellent 16 bit dimming. It is available in a Touring version with Neutrik Powercon connections, an IP rated version with dedicated connectors or an IP rated version with the new Neutrik NC3-HDD IP XLR connectors. • with full saturation control.